Reunions involving soldiers are always the most emotional and heartwarming. 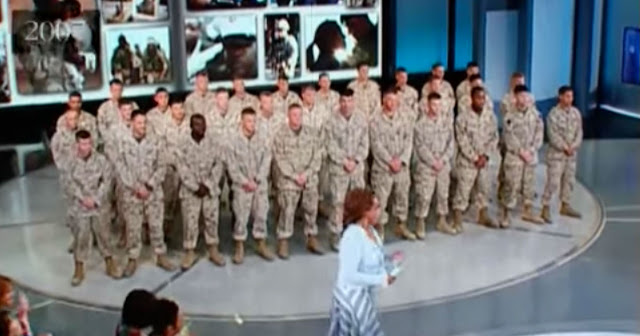 In 2007, Oprah Winfrey, along with her staff and crew, prepared a special surprise for 31 Marines from the 2nd Light Armored Reconnaissance Battalion, Alpha Company. Oprah invited them to appear on The Oprah Winfrey Show. While these heroes walked onstage to roaring cheers from the crowd, they thought they were going to be interviewed. Instead, Oprah and her team had other plans for them. Since, these heroes had just finished 7-month tour of duty in Iraq, many of them hadn’t seen their families yet. Then Oprah revealed the surprise. Once theses soldiers realized what was happening, they couldn’t contain their emotions. “And now, the moment I’ve been waiting for,” Oprah said. See the video below to see what it was all about. You don’t want to miss out on this!